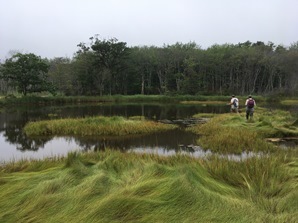 Using enhancement techniques, the goals of this project include restoring vegetation to areas improperly inundated, rebuilding interior marsh elevation, and providing suitable saltmarsh sparrow nesting habitat. The project will use innovative techniques proven at National Wildlife Refuges (NWR) including tideshed definition, runneling, partial embankment removal and ditch remediation. The project will work with natural processes to improve ecosystem functionality. USFWS believes that a "no action" scenario will lead to further subsidence, continued loss of high marsh conditions and depletion of productive saltmarsh sparrow nesting areas. They anticipate measurable increases in several salt marsh metrics including: revegetation (decreased open water to vegetated marsh surface area ratio), enhanced water quality (improved DO levels), increased soil strength (shear strength capacity), elevation gain, improved nesting habitat for the saltmarsh sparrow (a species of greatest conservation concern), and a more diverse nekton community.